Riviera Lake Villas Riviera Golf Estates Condos: 2 bed 2 bath attached villa 5 miles to downtown Naples! It offers single level living (no worry of noise coming from upstairs!) with an attached 2 car covered carport and an in-home washer and dryer, plus a comfortable screened lanai! Many design updates include: crown molding and baseboards throughout, no popcorn ceilings, raised ceilings in both bathrooms, tray ceilings in kitchen and dining area and custom closets! Updated mechanicals include a new garbage disposal, AC in 2017, water heater in 2014. Riviera Lake Villas is a 55+ community and is located next to Riviera Golf Club. It is convenient to shopping, restaurants and beaches! 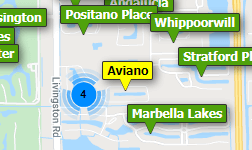 Need professional assistance selling your property at Riviera Golf Estates Naples? Find out how an Area Specialist can help to generate more property exposure in order to get the most money for your investment in the least amount of time.